I have been waiting patiently, oh-so-patiently to share this woolly story with you all, and am soooo excited that finally today is the day to tell. It's been six months actually, yes Half A Year that I've managed to keep this whole thing under wraps, and I have to tell you dear readers that it has been a devil of a job to keep shtumm. I don't do Secretive things very well, I am much happier with the Share Everything approach, so it is with some relief (phew!) and a huge amount of excitement (yippeeeeee!) that I am finally able to spill the woolly beans. If you've been reading my blog for any length of time, you will probably know of my Thursday morning routine. You will have heard me talk about jaunting off to the cafe each week for some sociable hooky time. The cafe in question is rather gorgeous. It's light and airy, decorative and happy. There are scrubbed pine tables, mismatched chairs, old wooden church pews piled with crochet cushions. And each Thursday morning it is filled with the noisy sound of chatter and laughter when the Knit n Natter group is in full swing. Any gathering of like-minded woolly folk is always a good thing in my opinion, and the enjoyment of sharing a creative passion with others is not to be underestimated. There is such a lot of fun and pleasure to be had when solitary crafting finds it’s way into a social situation. When the group first began, there was only a small handful of us that met regularly, but these days we are a rather large bunch who take over half the cafe. I would say the mix is fairly evenly spread between those who crochet and those who knit, and it's always a real joy to see what everyone is working on. So....shall we chat about the knit and crochet squares in the top picture? Here they are look, all handmade with love and ready to be put to good use. The whole of the Knit n Natter group helped to make these squares over the course of last Summer, and it was wonderful when we finally gathered them all in and laid them out. ....what a happy, woolly jumble! The joining of the squares was undertaken by my wonderful yarny friend Carole who runs the Knit n Natter sessions at her cafe. She and I have been hooking along together for five years and we were both so excited to see this project coming together. Whilst Carole was busy stitching up the woolly patchwork, I had a very important hooky job to do. I had to set aside my colourful yarns and work in shades of grey. With black details. I know!! I actually worked with BLACK yarn!!! As you can see, the black yarn was needed for a pair of eyes. Cute eh? When the grey and black was finished, I got started with the other part of my task which was to design and crochet a rosette. You know, the sort that gets dished out to Very Fine Animals at agricultural shows. I so enjoyed making this rosette, it came together really well. Baaaaaaaaaaaaahhhhhh! I crocheted a Sheep's Head!!! Did you expect that??!! I realise that at this point, you are maybe feeling a tad confused, I do apologise. First there was the cafe, then a pile of knitted squares, and now a sheep's head?! EH???!!! Well what we were trying to do was to create a delightful, fabulous woolly version of the sheep logo in the above picture. A handmade Patchwork Sheep no less. Would you like to see how it turned out when the legs and face joined the body? Oh I do love, love, love, LOVE our Patchwork Sheep!! As you can see, we had a very definite job for our Patchwork Sheep. We needed something fun and colourful to adorn some postcards. ....introducing YARNDALE 2013. A festival of creativity, celebrating all things woolly and wonderful! Yarndale will bring together a fabulous mix of retailers, manufacturers, craft workers and artisans from all over the country who are passionate about beautiful yarns, threads and textile treasures. There will be beautiful yarns, materials, haberdashery, books, kits and hand crafted goodies for sale. There will be creative exhibitions, demonstrations, displays and workshops. Did I mention the yarn? And did I mention the creativity? I can't tell you how much I'm looking forward to being at Yarndale. It promises to be an exciting and inspiring affair, with a great mix of things to do and see. There are already a good number of amazing artists and craftspeople who have booked a stand, but the Yarndale committee is looking for more. Would you like to take part? Do you know of anybody who would love to come and sell/demonstrate their wool/textile passion? There is lots of information on the Exhibitor page of the website, so do please spread the word and get in touch if you are interested. 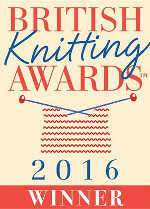 I will be taking part at Yarndale, oh yes, I will most definitely be there. I'll be sitting on a chair surrounded by crochet blankets with my back resting against a crochet cushion, hooking and nattering the day away in the "knit n natter lounge". I hope very much that some of you might come and join me there as it's going to be whole lot of woolly fun. Can't wait! I am also thinking of travelling north in September... I love all the stuff so much! Can you buy the yarn online somewhere? ohhh I wish I lived closer and could join you weekly. It looks like such a nice time. seriously amazing. when i think you can't be any more special, there you go. have fun love! Is Yarndale anywhere in Ravelry? Have been to Skipton a number of times, would love to return for this event and combine it with meeting up with friends in Lancashire and Cumbria. Sounds good. A great excuse to visit Skipton, which we last visited when "Flock to Skipton" was on. Your knit, crochet and natter sheep is amazing for Yarndale. I will have to arrange a weekend away to Yorkshire that just so happens to coincide with Yarndale in September. oh my goodness how exciting! i wish i lived on your side of the pond, and for a very special reason....i have written my first picture book (about a cow who KNITS!!!!!) and it is being published THIS YEAR!!!! wouldn't that be a fun addition to something called yarndale?! oh my goodness...i'm very excited for you! i know it will be a fabulous event and i can't wait to hear more!! that sheep is a DELIGHT! Si alguna vez vienes a Madrid, tienes una amiga aquí que estará encantada de recibirte y hacerte de guía en mi ciudad. Un beso fuerte de Puri. I am living and hooking vicariously from Seattle, Washington. If I was rich, I would fly over with my sister and I know we would have a great time. Have fun ladies! I'm on my fourth granny stripe afghan. I had to make one more to use up all the stray bits of yarn from the first three. Okay, I did buy a few more skeins! The sheep is fantastic and Yarndale sounds like lots of fun, I've mentioned to Beloved that a trip at the end of September to Yorkshire might be on the cards. I've nominated you for a Sisterhood of the World Bloggers Award, but if you don't do awards, I quite understand. ¡Qué bonito blog! Haces unas labores preciosas. Tienes suerte de poder ir a Yarndale. Muerdo mis uñas de envidia,jiji, y no me olvido de la graciosa oveja.